Tunnel vision is probably one of the best ways to create unproductive time. At a certain point it’s not focused concentration anymore. It’s just ignoring everything else and a lot of better opportunities. And it’s also limiting the angles and creativity you can apply to the current task. Now surround yourself with a whole flock of tasks like that. It’s like being in the middle of a forest but you can’t see the forest or anything beyond it. No matter what direction you look in, all you see is trees. Each one of those trees wants your attention. You have to get through one tree only to be greeted by another. And you have to clearcut valuable trees out of the way just to get some help in there. Go big. I use a pen and a simple pad of lined paper to organize my day most of the time. But when I really need to whip up a storm I have an 18″ x 24″ artists pad to scribble over. Think “whiteboard”. Think “that wall looks pretty bare”. Take it to the street. Get yourself some chalk and find yourself a bare piece of asphalt (preferrably traffic-free) and start crafting ideas. Wage a table-top war. 50 bucks will get you a trunk load of little green army men. Set ’em up on the boardroom table and game out how you’re going to storm the market. Oxygenate your team. Pull out the football and hit the field. Make it a rule to only discuss business, not plays. The game is just a conduit to get the blood pumping and the ideas flowing. Take a field trip. One of my favorites. Visit your competition, your suppliers, or your point of sale and chat up a storm. You will get amazing ideas from the outside and instantly see how you can incorporate them and make them even better. Captains log. Grab a video camera and start recording/acting out your ideas and bring a supporting cast with you. A camera changes the whole tone and has a way of bringing out everyone’s inner superstar. And even Captain Kirk didn’t have a video log. Go barefoot in the park. Just loosen up. Take off your shoes and walk through the grass. Or the creek. Or the waves on the seashore. Scan the sky or the horizon and just let your mind wander into new territory. The key here is that when you’re stuck, new ideas won’t solve your problem. You already know you need new ideas. It’s how to get them that’s the problem. And for that you need to get out and find a different approach. Now, up in the right hand corner of your computer you’ll see a little button that says IO. Our most valuable asset is time. Procrastination is the enemy of time. 1. Noun: Procrastination (pro’krastu’neyshun): To postpone doing what one should be doing. The simple definition tells us everything. Procrastination isn’t the problem. It’s a symptom of the real problem. We need to understand WHY we postpone doing things we should be doing. Connection. We connect with things we understand. When we don’t connect with something, it’s easy to not do it. It’s easy to not know where to start or what direction to take it in. Overload. The fastest way to create indecision is to put too many possibilities on the table. And the fastest way to create inaction is to put too many tasks on a list that can’t be done before the list grows twice as long as it already is. Passion. How many people here think the best part of a great meal is doing the dishes? Raise your hands … that’s what I thought. Most people are not passionate about doing the dishes. It’s just something that needs to be done. So now we understand procrastination. It’s time to get some things done. Just do it. Some things just have to be done. Do the dishes. It’s as simple as that. But the real key is to always keep learning. Connect with the things you have to do and find faster and easier ways to do them. Just don’t do it. Some things aren’t worth doing. Doing things just for the effort, just to fill every second of your time or feel productive is to sqaunder your most precious asset; time. Conquer your overload by doing the things that really matter. And by not doing the things that don’t. Just do something else. To do anything without passion should be a crime. Following your passion is the key to success, productivity, happiness and a hundred other things that are good for you, good for business, and good for the world in general. Sometimes it’s best to stop doing what you’re doing now, so you can start doing the things you really should be doing. The things you’re truly passionate about. There will always be something you have to do that you’d rather postpone. By connecting and understanding how to do more things, by preventing overload, and by doing more things you’re passionate about, there’ll be a lot less of those things. And a lot less procrastination. I almost put off writing this post till tomorrow. But you know what. There’s nothing else I’d rather be doing. Outsourcing your work is NOT about cost-cutting. If you believe it is, you have a 90% chance of getting exactly what you paid for. Garbage. Business success starts with having the right people. And outsourcing is about finding people who can do something better than you can, (and that’s where the cost savings really come from). If you approach outsourcing as a search for talented people, you’re creating a mindset that opens up real opportunity. It’s no longer about getting the cheapest junk at the cheapest price. I like to include graphics with my posts on Zoomstart because they add a lot to a post. I can do a lousy illustration in about 10 or 20 minutes. It takes me well over an hour to do a good one. And that eats up a lot of time that’s better spent writing and networking. So I started buying stock photos for a dollar or two. I get great stuff from a world of talented people. And the time I’m saving is worth much more than the cost. Time. Every venture has its core priorities. There are other things that are important, but they take a lot of time away from the core priorities. There are talented people that can do these things in a fraction of the time that you can do them. Find them. Quality. A good reason to do something yourself is to maintain the level of quality. But there’s always someone who can do something you need to do better than you can do it. Find them. Capital. Vertical integration (doing more yourself) can save you a ton of money. But there’s a cost to building the infrastructure you need to do more yourself. And that capital is often better used if it’s invested in your core priorities. Someone else already has the infrastructure and the expertise. Find them. Scalability. As you grow, you have to do more of whatever you’re doing. If you can’t build the infrastructure or bring in enough talented people fast enough, it’s easy to hit a wall. Someone out there already has the capacity to meet your growth needs. Find them. Reach. Networking is about who you know, and who knows you. Doing more business with other people leads to doing EVEN MORE business with other people. It helps you get known. It expands your network. There’s someone out there who needs you as much as you need them. Find them. Outsourcing your work by tapping into outside pools of talent will help you do more. Faster. And in the long run, yeah, you’ll still cut your costs. I came across a great post about blogging yesterday that was guest blogged by Leo Babauta over at Freelance Switch. His own site, Zen Habits sounded catchy so I wandered by and found a really great post about getting things done. Leo reframes GTD to ZTD (Zen To Done) and he makes some great points along the way. I’ve had some great experience pushing 20 hours worth of work through a 12 to 13 hour pipeline (day). So I thought I’d share a little of my own GTD philosophy here. This is a list of personal productivity strategies that I’ve put through the meat grinder. They work for me. If you’ve got your hands up in the air, don’t surrender quite yet. Give ’em a whirl. I use a pad of lined paper. Very high-tech. I divide it into big picture stuff, tasks, and miscellaneous ramblings. 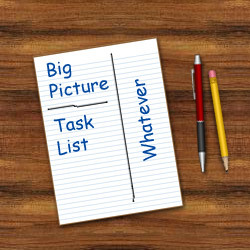 Whether you use a pad of paper, a day planner, a Palm Pilot, Outlook or the wall next to your desk, keep only one list. On one page. If your list is longer than that, it’s time to stop listing and start doing. Big picture stuff is longer term. Maybe a week or a month or so into the future. If something sits there undone for too long I cross it out. It was meant for someone else’s picture. The task list is the daily or through-the-week stuff that needs to get done. Pretty straight forward. Ramblings. Phone numbers, events, addresses, pricing, brain-waves. This is where I jot down stuff on the fly. Info. Reminders. Some of it needs to be put into a permanent archive like an address book. And some of it just needs to make sure I get to the dentist at 3:00. Prioritize the things on your list. If you’re not sure what to do first, do the stuff that makes you money first and the stuff that costs you money last. Other than that, knock off the easy stuff and then settle in all relaxed on the tougher stuff. It’s okay to jot down things on napkins, sticky notes, business cards and whatever. But at the start of the day I put all this stuff into my organized list. Remember, keep one list. I’m always adding to the list. When it starts to get messy, I rewrite out whatever is left on it and add a few new things as needed. It might seem kind of slow and silly, but I do it as needed and it helps me ruminate or, think about, the stuff I need to do. The easiest way to knock stuff off your list is to get someone else to do it. Sometimes someone else can do better than you can anyway. Delegate. Whether you’re controlling a 24 square foot piece of desktop real estate or a hundred thousand square feet of manufacturing facility, everything has a place. And at the end of ever day, it needs to go back there. No excuses. I know, you’re just going to use the whatchamacallit again tommorrow. So make that place where it belongs a little more easily accessible. And put it away when you’re done with it, or at the end of the day. Whichever comes first. This is the absolute cornerstone of keeping any physical space organized. No matter how big or how small. Spend less time planning what you’re going to do and more time doing it. I can’t make the Zoom Method to getting things done any simpler than this.